This particular recipe however, is the result of a serious craving for sun-dried tomatoes and salami… How very Italian of me si? It is very simple and great for a quick snack. The Salami I got at the deli at Muthaiga Mini Market, as well as the sun-dried tomatoes; which by the way, were made at a farm in Kitengela and had just come in. But if you don’t find any at the deli counter, you can always use the ones that come in jars.I also got some buffalo mozzarella made from the same farm.. you don’t see this kind of cheese often, so I had to buy it! Start by slicing the bread diagonally and placing under the grill to toast. Once nicely toasted, remove from the grill and rub with a sliced garlic clove. Add the cheese and return to the grill to melt the cheese. This should take about 3-4 minutes. 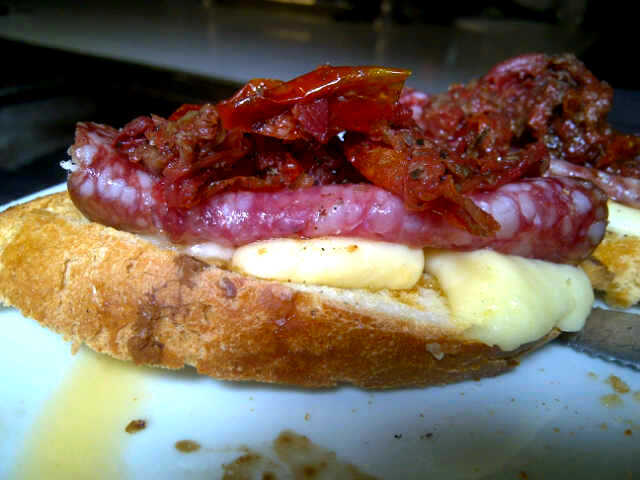 Once cheese is melting, add a slice of salami and top with sun-dried tomatoes. I drizzled the oil from the tomatoes on top. Salt and pepper and it is ready to eat! There is only one way to eat this so as to maximise on taste… On the floor in front of the telly with a kitchen towel draped over your shoulder, preferably with a glass of wine next to you! Trust me on this one… Try it and tell me how amazeballs the experience is! Of course don’t forget to mumble “Absolutely Delightful” just like Julia!